ZURICH, Switzerland – HARMAN’s Studer will be showcasing its OnAir 3000 digital mixing console at the International Radio Festival (IRF) 2014 in Zurich, Switzerland, August 21 through September 7. The IRF is the world’s largest public on-air festival and conference and brings together industry professionals and radio stations from around the world, which will be broadcasting shows to a worldwide audience and giving attendees the opportunity to “Listen to How the World Sounds.” The Studer OnAir 3000 will also be featured at SwissRadioDay 2014, which will take place during the IRF on September 3. The Studer OnAir 3000 is a highly versatile digital console designed for radio and TV broadcasting and production. 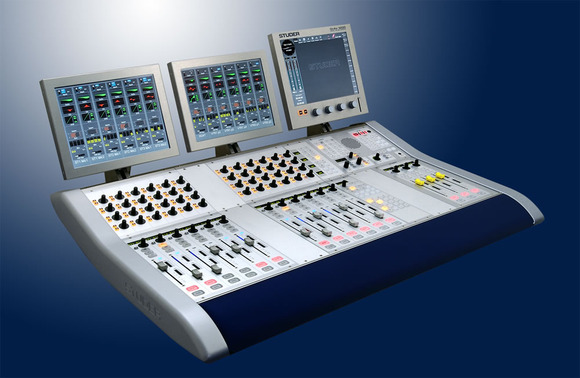 It features Studer’s exclusive Touch-n-Action color touchscreen user interface that provides intuitive operation and ready access to all key functions, and offers a comprehensive array of cueing, routing, signal processing and metering options. The Studer OnAir 3000 is based on a completely modular concept. The fader module includes six fader strips and up to eight fader modules can be fitted for a maximum console size of 48 faders. A variety of layout options are available, to perfectly tailor the OnAir 3000 for any radio or TV broadcast application. Available modules include fader, motorized fader and fader assign modules; monitoring and talkback modules; main screen and fader screen modules and more. The console provides a host of digital and analog connectivity options. The OnAir 3000 provides three main stereo mix busses plus an audition facility, four stereo AUX busses and three independent studio monitoring circuits with a talkback speaker built into the console. The console offers assignable rotary controls and complete EQ, dynamics processing, noise gate, de-esser and other processing and input/output routing for each channel. The OnAir 3000 integrates completely with radio playout systems and the Studer CMS Call Management System that allows the operator to easily manage incoming phone calls on a single screen.